Really this could be any of your favorite stuffings right down to turkey and dressing stuffing. Last night I used fresh mashed potatoes and Conecuh sausage. This recipe will leave you with extra mashed potatoes to make potato cakes with for breakfast! Grill or sauté in cast iron skillet until fine. Cover 2 pounds of your favorite potato with cold salted water; simmer 45 minutes. Drain, peel and mash with 1/2 stick butter. Add 1/2 - 3/4 cup milk if potatoes are to dry. Mash until smooth and fluffy. In a mixing bowl add the cornmeal, flour, salt, eggs and buttermilk. Mix well with a spoon. If batter is to thick add a bit more milk or a few dashes of water until you get a think creamy consistency. Gently open the squash blossom while cradling it in the curve of your thumb and forefinger. With a small spoon begin to fill the blossom. The stuffing should be thick enough to stay with no running. Pull the flower petals up and around the stuffing closing the blossom at the top. Add oil ( about 2 inches deep)to a well seasoned cast iron skillet. Heat oil (I chose safflower). Once hot, add 2-3 blossoms at a time. Flip over once browned. Don’t walk away as they brown up quickly. 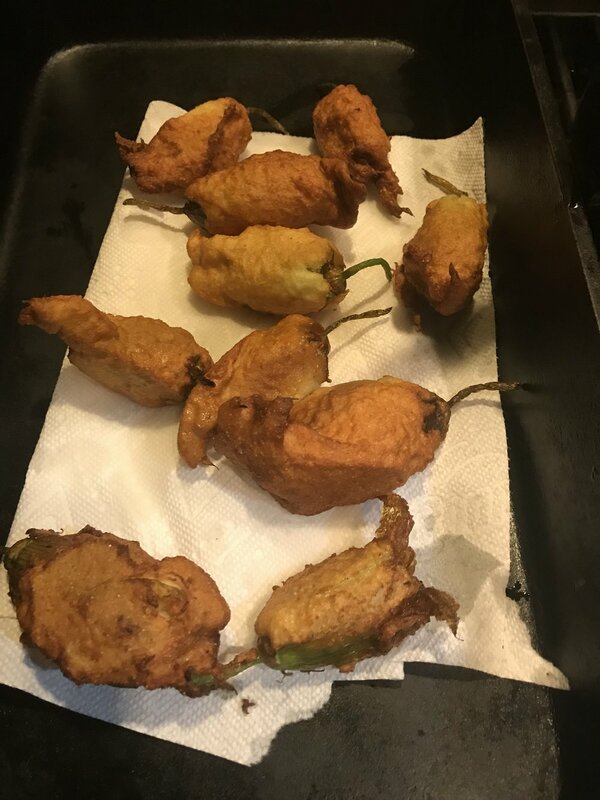 Drain deep fried blossoms onto a paper towel and enjoy while hot. If you don’t like sausage you might want to make a dipping sauce. Stone Hollow Goat Cheese whipped with a dollop of Greek yogurt and seasoned with garlic and dill would be my suggestion.